In my last post on Rome I dealt in generalities and impressions, so in this post I’ll cover some specifics. Or more to the point, certain definable items that seemed to be the norm in the Roman males’ wardrobe. Sadly I won’t be covering Italian suiting and business wear. I was there over a weekend so these notes cover the weekend wardrobe. It was my intension to provide you with lots of beautiful photos, but sadly my stay coincided with Monsoon Season. So we’re making do with the few images I could snap and those I’ve pinched from elsewhere. Given the whether it is perhaps natural that the primary element to elicit my attention was outerwear. 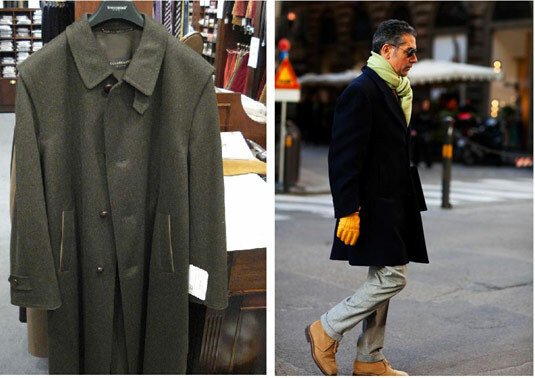 When I think about Italian coats I think double breasted, wool, cashmere, moleskin and of course Camel; all in keeping with those wonderful shots on The Sartorialist. But I saw none of that. What I did see was to my English sensibilities an eye opener. Standing at the Roma Termini taxi rank I caught the last few moments of the Roman working week. 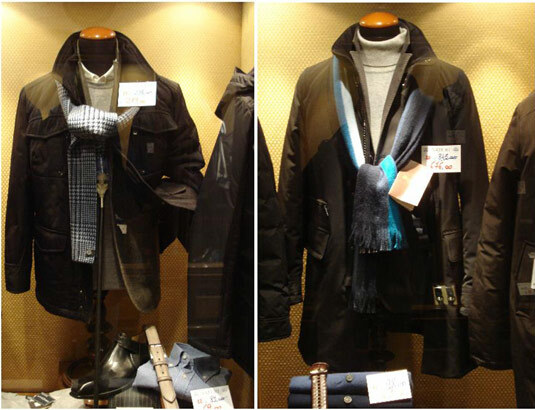 It was a wet, windy cold Friday night, ideally suited to the natural qualities of the Loden cloth. A subject we covered here many posts ago. Thinking about this coat with its tent-like cut, the long centre pleat at the back, compared to more conventional styles it has sprezzatura built in. Most of the men I spotted wore them long – just above the ankle or round about mid calf with the collar flipped up. A bright contrasting scarf and suede footwear added touches of sympathetic density (imagine the chap at the top in a 3 quarter length coat). When you think Italian chic, anoraks don’t exactly spring to mind. But these were everywhere. Black Gortex seemed to be the standard. Even the business men I spotted not wearing Loden coats had these on. In England such coats are often found in charming shades of beige and are the preserve of old men. But Roman’s combine practicality with style, keeping the cuts slim and waists shaped, the colours muted – any colour you like as long as it’s black. They use scarves, suede shoes and thick trousers to add interest and luxuriousness. They also layer, wearing jumpers and jackets underneath, making a practical glamour-less coat a blank –albeit black – canvas. This appeared to be the must have bit of outwear for the season. Well, I don’t know about your neck of the woods but here in England Puffa jackets are regarded as a bit naff, particularly by middle class types like myself. Of course take the sleeves off call it a Gillet and you’re virtually Old Money, but that’s another story. In Rome the Puffa was the keystone of the weekend wardrobe. Cut in a variety of lengths, some complete with fur collars. Again, cuts were slim, and combined with muted colours and suede footwear. In the final part I cover footwear and other details that caught my eye. Attolini scarf on the left, I think. Very warm. What is shown as an anorak is very fa-a-ar from actually being one!? 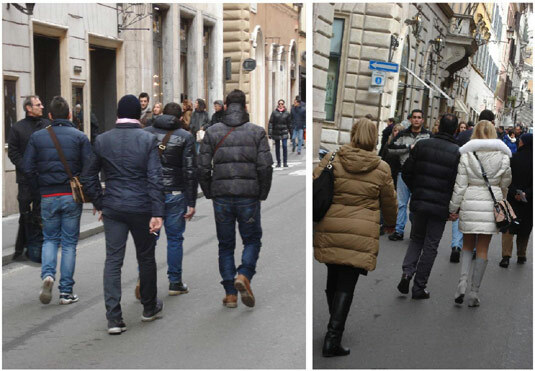 The Italians can’t be beat on tailoring but when they dress down for casual weekend wear they seem to suffer. Sartorial elegance goes out the window and out come the puffa style jackets an off shoot of the even more ubiquitous ski jackets seen around the city.